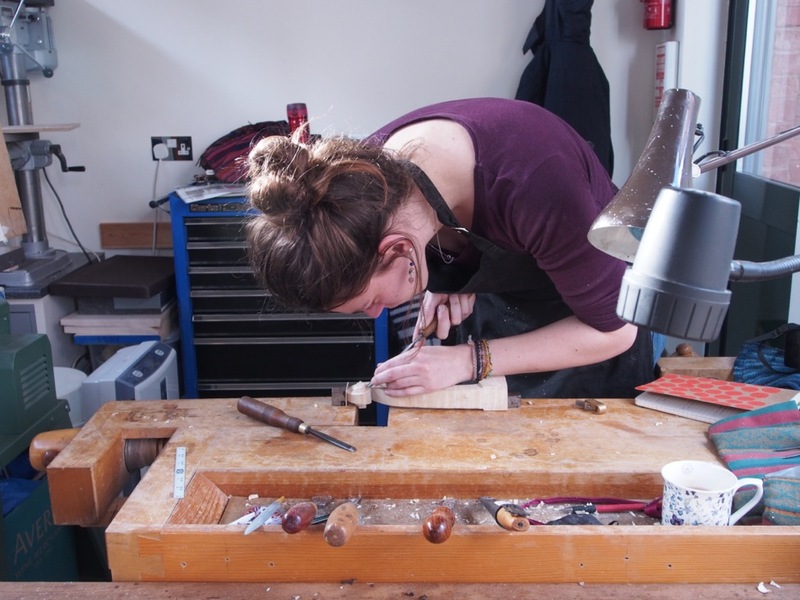 RAB Award 2018: funding for cello wood and work experience placement at Guivier. After the coldest winter in Manchester, the hottest summer in London! On the 18th of June I arrived at Guivier’s for my second RAB Trust placement. I had agreed on the dates of the work experience with Richard White, who runs the shop. He had advised me that I would work on set up, and invited me to bring some of my instruments along if I wished for feedback. We quickly got to the heart of the matter. He picked one of the shop violins, and showed me how to adjust one peg until it fits and turns smoothly. He let me work on the 3 remaining pegs, checked the result, and stressed the importance of them turning all equally, always reminding me of the player’s point of view. He showed me how to reshoot the fingerboard with the right plane, set up properly and sharp and then let me finish the surface with file and different grades of sandpaper. When came the moment to check, he showed me a few remaining bumps and tool marks I hadn’t spotted. I re-worked on it until it was closer to the shop’s standards. It was time to determine the bridge position. Kwon Su showed me how he roughly fits the feet and brings them closer to their final thickness. I was very interested by his use of a chisel for this. The bridge position was marked, and I didn’t know at that point I was about to experience my first challenge of this work experience: fitting the soundpost. Having set up 3 of my violins, I thought I started at least to have an idea of soundpost fitting, and started the task with no anxiety. A day and a half later, it was clear I would have to make a new soundpost for each of my own instruments. The school had taught me the general principles of a soundpost and given general advice on how to fit it, concluding with the necessity of practising. Guivier’s taught me how to put a soundpost absolutely straight in the instrument, and to fit it aiming to a 100% contact with both plates. By testing patience and perseverance until it was good, and not just good enough, I took the first of many steps during these two weeks towards raising my standards. I was then shown how to fit the feet and cut the arch on the bridge, and tried to reproduce it. I cut the top of the bridge to obtain the right string height. After this we decided that I needed more practice before the next step, which was trimming the bridge. I was handed another violin to repeat the steps of peg fitting, shaping the nut, bridge position, soundpost, bridge feet fitting and string height. Then another one. After these two practice violins, I felt like my skills started timidly improving. A week had gone by, and Kwon Su seemed to think it was the right time to make me look at my own instruments again. I took the 2 violins I had brought out of the case… and saw an avalanche of details on my set up that needed improvement, of which I was so far from aware before! It felt very encouraging to see how much my looking had evolved, and I feel very motivated to try and practice now towards these raised standards. Bridge trimming was very interesting too. Even though I had sharpened all my tools before arriving in the shop, we came to the difficult but fair conclusion that I had to re-think my sharpening methods, and review all my tools. Kwon Su shared with me his method of sharpening which is straightforward, precise and efficient. I received an example bridge of Guivier’s style, and with my freshly re-sharpened knife I tried to reproduce carefully as many of the details as I could. Then I had another look at my instruments, and came to the conclusion, again, that I couldn’t possibly keep their bridges. For the last two days of my time in the shop, I was given the choice and decided to practice one last time soundpost and bridge. I was given a ¾ instrument this time, and even though the measurement were slightly different I felt like I was slowly settling and had an idea of where I was heading. The two last bridges I cut in the shop were still beginner’s bridges, but they were much better than any one I cut at school, and I intend to focus on making them better. I will remember my two weeks at Guivier for a long time. The shop has such high standard and is so focussed and respectful on the musician’s experience of the instruments; I loved the atmosphere in there; every member of the staff was so kind, encouraging and welcoming. The head of workshop dedicated a lot of his time to teach me, pushed me to raise my standards while being encouraging, open and honest. We also discussed my future in the violin making world, he gave me his point of view on the necessity to learn with one professional whose work I would esteem for at least two years. I feel inspired by how they carefully think through every of their repairs and set up, and carry them on with precision and efficiency. Without the Rab Trust, I would never had access to such a place, and I want to send a warm thank you to all the staff at Guivier for a work experience of such high quality. 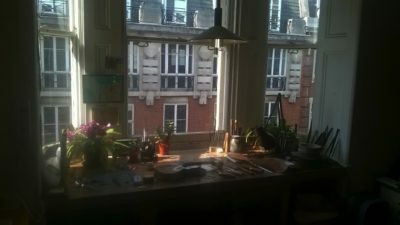 I arrived at Helen Michetschläger’s workshop during the snowiest week that Manchester had experienced for a long while. 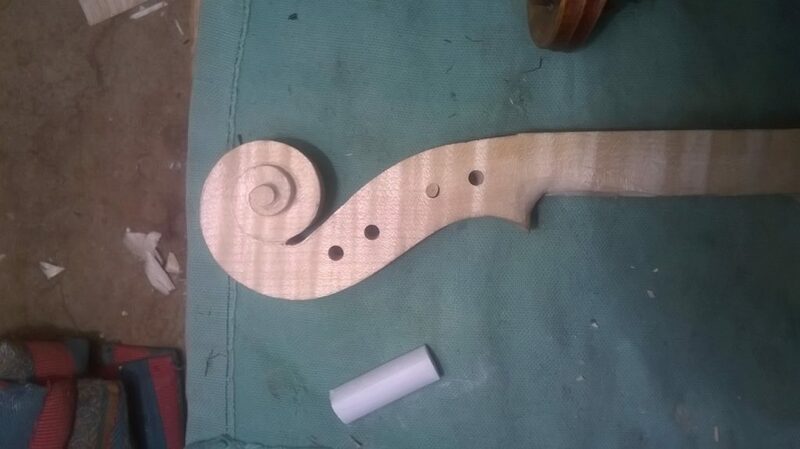 My initial project was to carve the scroll for a Guadagnini model violin I had started in a previous work experience. Helen told me five days would be too long to carve a scroll only and encouraged me to think of a side project. I explained to her that I was feeling quite anxious about setting up my first violin, and we decided to go through that together too. 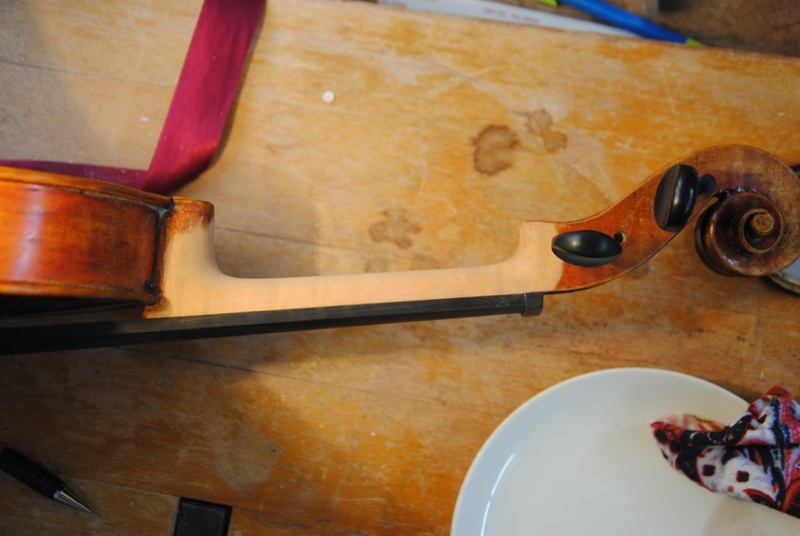 We started the week by reshaping the neck around the fingerboard I had just glued on my violin. She helped me getting a shape that would be comfortable for a musician and showed me a useful recipe to stain and seal the neck. On Tuesday and Wednesday we had a good look at the wonderful book J.B. Guadagnini – Masterpieces from the Parma 2011 Galleria Nazionale Exhibition which was a great help to have a better insight into the different periods and changes of style of this maker. We discussed which details we wanted to copy and it made me look at shapes with more accuracy. Helen was working on her viola while I was carving, so I could get a glimpse of her methods and tools for arching and purfling too. I also got the chance to mark and drill the peg holes in a different way than we are taught at school, allowing slightly more spacing between the D and A peg so that the player can tune more comfortably. We then chose to spend the last two days on the set up of my violin, the neck being now corrected, stained and sealed. I replaced 3 of the pegs I had come with by better fitted ones. After that, I glued the top nut and shaped it following a very useful article from Andrew Finnigan that Helen showed me, adjusted the endpin and put on the tailpiece before coming to the biggest part: the bridge. Helen had created a handout with measurements and tips on where to remove material from the bridge and why, and I am sure I will keep going back to it!